Untuk Tamu lokal kami memberikan tarif yang lebih murah, info lebih lanjut silahkan menghubungi kami. All reservation will be proceeding if you fill completely our Reservation Form. Your reservation will be reply at least within 1 x 24 hours. Select rafting package you want, and send your request via the booking form that we have provided, also include your question if you want to consult it first. Confirmation, we will send the booking confirmation to you by email when all clear, including your invoice. You can pay your invoice all at once or pay a deposit of 50% to hold your space. 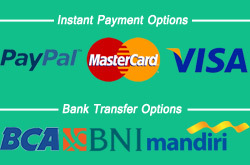 Payment can be made via bank transfer, paypall, credit card, and by cash.